We are Manufacturer, exporter and supplier of Floor Stand Low Speed Centrifuge, High Speed Refrigerated Centrifuge , Floor Stand High Speed Refrigerated Centrifuge , High Speed Large Capacity Refrigerated Centrifuge, Crude Oil Moisture Determining Centrifuge, Low Speed High Capacity Refrigerated Centrifuge, Low Speed Large Capacity Refrigerated Centrifuge, Low Speed High Capacity Refrigerated Centrifuge, Ultra High Capacity Refrigerated Centrifuge, Low Speed High Capacity Centrifuge, Ground High Speed Refrigerated Centrifuge, Thermo Scientific, Laboratory Centrifuge, Medical Centrifuge etc. 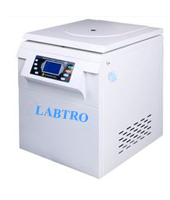 Labtro high speed refrigerated floor model centrifuge provides RCF of up to 54,000 ×g and high capacity of up to 6 × 1,000 ml. Labtro Equipped with all standard and attractive features expected from a good work-horse centrifuge, 2236R has outstanding advantages such as a wide range of rotors and accessories including fixed angle and swing-out types with several adapters, and advanced features in control and display interface.